Two men and a teenager have been arrested following a drugs bust in Queens Park on Thursday night (February 7). Police recovered a large amount of suspected Class A and Class B drugs in the bust, which took place in Coventry Road. They also found mobile phones and suspected drug dealing paraphernalia. Both men were in their 20s. Neither they nor the teenager have been named. The operation was run by Bedfordshire Police’s new Boson north team. The group is dedicated to tackling gun and gang activity, serious youth violence and associated criminality in and around Bedford. Sergeant Luke Blackburn, who is heading up the team’s proactive operations, said: “This is exactly the type of activity we want our team to be doing. 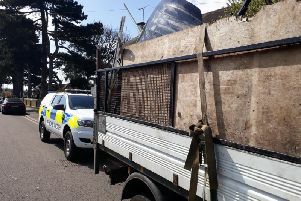 “This was just the latest in a number of warrants we have carried out since the team launched in January, and further activity is planned over the coming weeks. Anyone with suspicions about gun or gang crime can report them to police on 101 or via Bedfordshire Police’s online reporting centre. You can also contact Crimestoppers, anonymously ,on 0800 555 111 or via www.crimestoppers-uk.org You will not be asked for your identity and you will not have to appear in court.